Pink Sky: Another Doll Quilt! 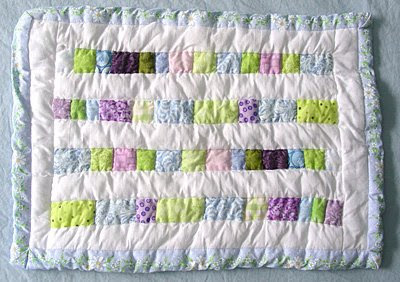 I made this little doll quilt for another friend I was exchanging handmade things with. It's made from leftover scraps from a larger quilt I'd cut out a year an a half ago. I called it Hydrangea because the palette is based on the colors of hydrangeas. It's machine assembled and hand quilted (stitch in the ditch) with traditional binding.